Pull on soft-soled moccasins with ruffle trim and beading made for babies. Lace-up soft deerskin moccasins with rabbit fur trim and beading made for babies. Colour is tan with grey-black fur. Sizes available: 1 through 6. 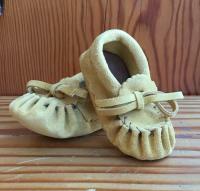 Lace-up soft deerskin moccasins with rabbit fur trim made for babies. Colour is tan with grey-black fur. Sizes available: 1 through 6. Lace-up moccasins with rabbit fur trim made for babies. Colour is pink. Sizes available: 1 through 6. Lace-up soft soled deerskin moccasins with rabbit fur trim made for babies. Colour is tan. Sizes available: 1 through 6. Lace-up soft suede moccasins for babies. Colour is Indian tan. Sizes available: 2, 4, 6, 8. Soft suede moccasins made especially for babies. Sizes available: 2, 4, 6, and 8.